Drafted in the 3rd round of the 2007 draft, the Texans were looking for some help at runningback after the sudden retirement of team career rushing leader Dominack Davis, and found it in the dimunitive package of Steve Slaton. At 5′ 9″, 197, Slaton was slotted in to share time with Chris Brown as a 3rd down back, but with Brown injured, Slaton assumed the starting runningback duties full time. Steve would have an impact rookie season for the Texans, helping the team achieve their first non-losing record at 8-8. Extremely dangerous out of screen plays, he led all rookies in rushing yardage with 1282 yards rushing and 377 yards receiving. 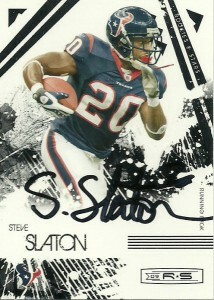 Everybody saw bigger and brighter things for the young Steve Slaton in 2009 but some talked about the ‘sophomore slump’. Whether or not it was true, Slaton suffered a down year dogged by injuries and 7 fumbles. Slaton would admit himself that he was suffering from incredible neck pain and then it was discovered he had fractured a vertebra. After 11 games, Slaton would go on injured reserve. Still Steve did manage to catch 44 balls, for a career high 417 yards, but his effective yards from scrimmage were halved. In the meantime the Texans discovered Arian Foster buried on their depth chart and by the start of the 2010 season, Steve faced a much different backfield than he was leading in 2009. In fact, the Texans drafted Ben Tate, and then they grabbed Derrick Ward via free agency. With Tate injured early on Slaton would be ensured a spot on the roster. He would do what he could as the team’s starting kick returner. Steve would average 19.7 yards a return on 39 kicks and finish with almost 1000 yards from scrimmage in 2010. Steve’s situation in Houston remains cloudy. I really like the kid, and think he can perform in an Eric Metcalf sort of way provided he’s given the 3rd down back potential to do so, but at this time he remains buried on the depth chart. Rumors as of this date continue to swirl around him being traded and as a possible landing spot, -Washington has surfaced. I was dismayed that one of my friends beat me to the punch and drafted him in my fantasy football draft in 2009, but luck shined my way and I ended up with Chris Johnson who had a 2000+ yard season and led me to a fantasy championship.